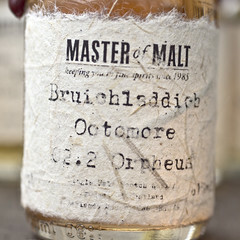 Bruichladdich are one of the most prolific producers of single malt whisky in Scotland at the moment. Based on Islay they opened in 1881, closed (as many did) in the mid-90s and then re-opened in 2001 under the eye of Mark Reynier, who led a group of private investors in buying and restarting the distillery. I first tried one of their whiskies shortly after the distilery reopened, but can remember very little other than it was the first whisky I tried that reminded me of the sea. More recently they’ve become known for both their experimentation and for releasing of lots of their experiments – just looking at Master of Malt they have 68 distillery bottlings listed, which is more than one new bottling every two months since the distillery reopened. Everything from cask finishes and slight variations on the core range to their X4 quadruple distilled spirit (rather than the two that single malt scotch usually gets) and Octomore, supposedly the most peated whisky ever made at 140ppm. 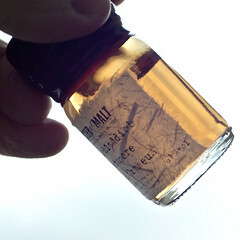 They’ve done a couple of releases of the Octomore, each with a different twist on the idea, and I recently grabbed a sample of their most recent release from Master of Malt’s Drinks by the Dram – Octomore 2.2 Orpheus. The tweak on this one is simple – they finish the bourbon matured spirit in red wine casks. 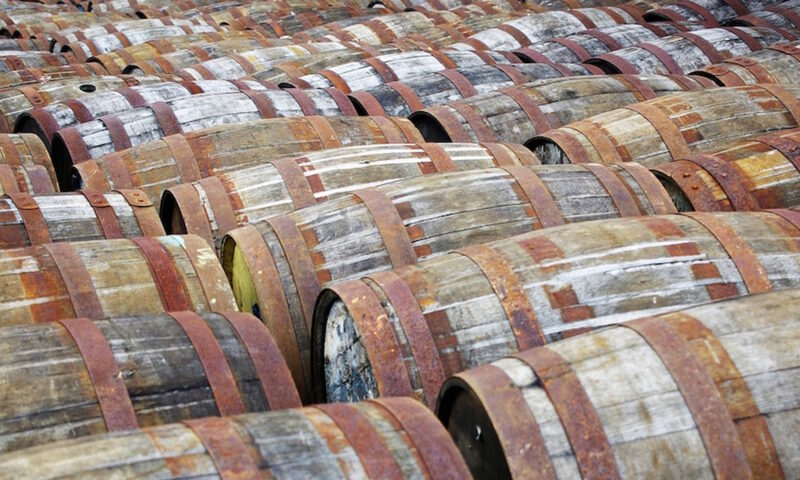 However, just to make sure that this is a little bit more exclusive they used Petrus casks. It’s a bit older than the earlier editions, at 5 years, and has been bottled at its full 61% cask strength as part of a limited edition of 15000 bottles, which are now starting to rise in price as collectors snap them up. The earlier releases of Octomore inspired a lot of underwhelming reviews, going up against the first edition of Ardbeg Supernova as they did, but this one seems to have done a bit better, even if it has produced the expected love-it/hate-it reviews. The first thing that you notice about the whisky is its colour – it’s pink. It may have only been finished in the wine casks but has picked up a lot of the colour from the wood. On the nose it has sweet peat, as expected, as well as vanilla, grain mulch and an underlying savouriness that I’ve noticed in most wine cask matured whisky (the flavour that I have now stopped calling ‘bbq chicken’ because it was starting to get me funny looks). It was cloying, with the peat and sweetness sticking at the back of the throat as I sniffed. To taste it started with mud and sweetness before moving through bitter lemons and spicy wood. It had a menthol quality that dried the tongue and this lingered into the finish with more peat and salty caramel. At 61% and with this much peat it could take a lot of water, and it’s the peat which gets hit most by the addition. The mud and peatiness mellowed, leaving the sweetness, spicy citrus and menthol, and the finish got a slab of butteriness, rounding out the caramel flavour. I’ve not tried any of the other releases of the Octomore but even if this is the best of the bunch I’d like to go back and have a go – this is really rather nice. A touch of water brings out the best in it, mellowing the fire of the young whisky and some of its peatiness and bringing out its underlying richness. The wine casks add a bit of meatiness to the body, but otherwise leave the spirit to shine (which from my point of view is how it should be) and it’s definitely gone on my ‘nice to have in the cupboard’ list. Hmm, I’ve heard (not yet opened any of mine) that the Laddie Black Art is pink as well. Might have to schedule a sampling time with yourself!